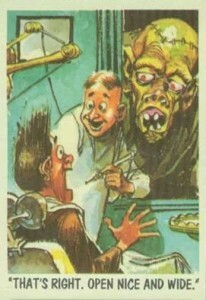 1959 Topps You'll Die Laughing (also known as Bubbles Inc. Funny Monsters) is one of the pioneering sets not only in the history of entertainment cards, but the history of the monster card sub-genre as well. When taking the time to delve into the makeup and background of this particular set, one will find that there are many unique and special aspects to it. At first glance, you may not be familiar with the company who produced this set, Bubble Inc. However, almost assuredly, you are. Bubble Inc. was the name under which Topps released sets that they determined might be met with some backlash by consumers. By hiding behind a pseudonym they were putting potential negative publicity at arm’s length. Topps quickly found out that any kind of press, good or bad, resulted in publicity and ultimately sales. Other sets to originall use the Bubbles Inc. name include 1962 Topps Mars Attacks and 1965 Topps Ugly Stickers. 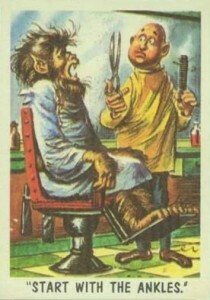 1959 Topps You'll Die Laughing cards feature detailed color sketch work of some of the most recognizable movie monsters. Also included are some impressive new artist creations The full-color sketch on the front of the card is coupled with a satirical caption that's supposed to get some chuckles. This was, in all likelihood, an attempt by Topps to minimize the potential negative reaction from parents to the card's subject matter. By adding gags, it lessens the opportunity to say that these weren’t scary or evil monster cards. Instead, they're funny, whimsical monster cards. Card backs reveal the You'll Die Laughing name. 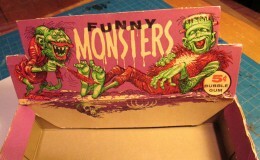 The original boxes and packs have the set labeled as Funny Monster. Backs all feature the same classic movie monsters like Frankenstein and The Mummy gathered around graveyard tombstones. The words “You’ll Die Laughing” run across the top and a joke is printed inside a framed border. Other than the packaging, the name Funny Monsters is nowhere to be found on the cards themselves. The sketches on the front of each of the 66 different 1959 Topps You'll Die Laughing cards are eye-catching and definitely the highlight of the set. The artist responsible for them, Jack Davis, is also well known. He is one of the founding artists behind Mad Magazine as well as over a dozen T.V. Guide covers. 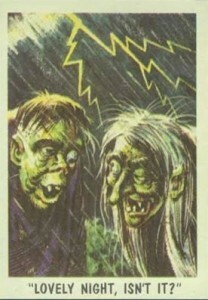 He has also did work on many EC comic books including Tales From The Crypt. This set serves as a focused portfolio and does an incredible job at capturing a great selection of his work. Being a set from the late 1950s there is always the issue of condition sensitivity when trying to find singles. For the most part collectors will have no trouble finding cards in the EX to NM range. In addition, for its age, 1959 Topps You'll Die Laughing remains an affordable set to try and compile in higher graded condition. 1 I Just Came Back From the Beauty Parlor, Can't You Tell? 3 I'd Like To Buy a Monster Mask! 4 Boy, When I Get a Headache, It's A Beaut! 5 Ma, Did You Call For a Baby Sitter? 6 Doc, Can I Stop Taking These Reducing Pills? 8 What O'ya Mean There Are No Man-Eating Plants in Bongo Land? 10 So You Really Think You've Rediscovered The Jekyll And Hyde Formula, Eh Twombley? 11 Earth Monsters! Full Speed Back To Mars. 12 What Happened? You're White as a Sheet? 14 What Do You Mean, Shirley I'm Not Your Type? 15 Just One Drink and I Start Seeing the Strangest Things. 16 Wait Till I Try This on Tthe Next Customer! 17 I Told You Time and Again, Smoking Will Stunt Your Growth. 21 Gulp! I Don't Know iIf I Have Blue Suede Shoes in Your Size. 22 That's Right. Open Nice and Wide. 23 Your Whole Family Will Enjoy This Picture. 24 Trick Or Treat Lady? 26 Start with the Ankles. 27 What Have You Got in a Red Perfume? 36 Look Ma, No Cavities. 37 So, There's a Fly In Your Room, So What? 38 Lovely Night, Isn't it? 39 What Did You Find in Your Prize Package? 40 Mr. Durstrum Is in Charge of Weird Stories. 41 Did You Say There Was Somebody on the Phone Dear? 43 That Department Store - They're Always Sending Me the Wrong Thing. 44 I Took 6 Lessons. How Come I Ain't Popular Yet? 45 Those Missionaries Did a Good Job Here. 46 So I Said to the Witch Doctor, "I Dare You To Shrink My Head." 48 Waddaya Mean It's Bad Luck to Walk Under a Ladder? 49 Doc You Got to Do Something. Every Time I Smile, I Bite My Nose. 50 Pay No Attention to Him, Dear. 51 If You Want Anything - Scream. 52 Can I Borrow A Cup Of Poison? 53 Who Put Pepper in My Bubble Gum? 54 Darn Few Arguments when Smedley Umpires a Game. 55 How Are Your Silly 'Invisible Man' Experiments Going Henshaw? 56 Do You Believe in Humans? 57 Would You Wrap it as a Gift Please!! 58 I Told You We Dug Too Deep! 59 You Will Soon Meet A Tall Dark Man. 60 It's Going to Rain. I Can Feel it in My Bones. 61 There Will Be a Slight Additional Charge Sir! 62 Tsk Tsk! How Silly Can TV Get? 63 I Can't Understand Why Girls Don't Like Me! 64 C'mon Charlie, You Can't Fool Me with that Silly Disguise. 65 Heh! Heh! Wait Till They Find Out I'm the New Baby Sitter. 66 This Photographer Does Beautiful Work. I am interested in buying a set (all 66) if the condition is good. Can you contact me with details? These are a significant trip to the past when kids like myself and many others had great fun with pastimes that didn’t involve the ever intrusive world of electronics, computers and the internet, just good simple fun! I’m looking for the box, the cards came in. Does anyone have any information as to where I might find one? I have a complete set of these. Cards are in plastic sleeves and have been stored that way for quite a few years. The cards are PERFECT. Crisp corners, no creases and over half are perfectly centered. Let me know if there is any interest in purchasing the set.